So how did we get on in Gameweek 23? In a Premier League week full of goals, we managed expertly to pick out just two goalscorers. Additionally, it is worth bearing in mind that bringing in Mohamed Salah last week has saved us from a truly awful score. 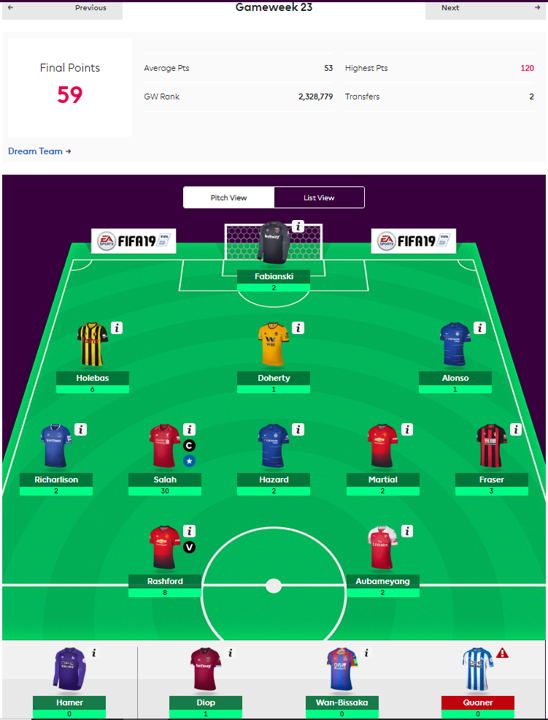 With 53 points the average score in a particularly high-scoring week for most FPL managers, we must thank Jose Holebas for his efforts in bringing us just above medium. As Trystan rather unhelpfully remarked: if only FA Cup goals counted. Anthony Martial, Matt Doherty, Richarlison and Pierre-Emerick Aubameyang scored in the FA Cup this weekend (plus Eden Hazard in the League Cup), clearly all well-rested from doing nothing much in the league for us. Another red arrow is this week's prize. We have become, we think but cannot confirm, the first team in history to be turned down by Sam Allardyce. Big Sam is holding out for an offer to return to Everton, apparently. Martin O'Neill snubbed us for Nottingham Forest, we can't meet Alan Pardew's terms, Frank de Boer is too expensive and Harry Redknapp is "too famous" to "return our hundreds of calls" and we should "stop bothering him" before we "get a court order" or something like that. Yet, as aforementioned, we have total faith in our current manager(s). It appears my commentary over the last few months has left the team wishing to defend themselves, and so as of this week you can listen to our new FPL Weekly Podcast! Expertly edited by myself, until the end where I’ve somehow wiped out our goodbyes with our shiny new theme music. I can tell you that I said “thanks for listening”, Rob said “cheers guys “, Trystan “see ya“ and Tim “bye“, before I needlessly added “see you soon”, which famously is not how audio works. 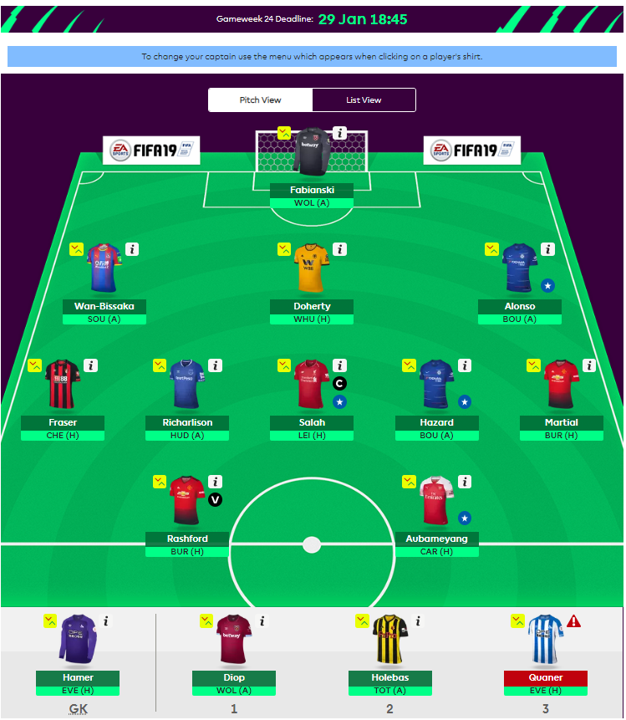 A wildcard beckons, but, it is not this week. I could dress it up for you, but almost nothing has been done. Team TSZ are holding their transfer, with a view to move for Sterling by the weekend. Salah is el Capitan, while Colin Quaner remains invalid. Marcos Alonso is living on borrowed time, while Issa Diop is just here for the mentions. During our podcast, Tim asserted several times that Aubameyang would run riot over Cardiff. Readers of our previous articles will know now that this is the time to swap him out of your first XI. Other than that, I can confirm for you, readers, that Aaron Wan-Bissaka plays. Do listen to our podcast, though (available at the top of this article! ), where we discuss the important things: the pros and cons of early transfers, incoming double gameweeks, the “Pep Roulette” phenomena, our captain picks, our differential punts, and whether or not Cardiff City are coming-or-going (to Aaron Ramsey).